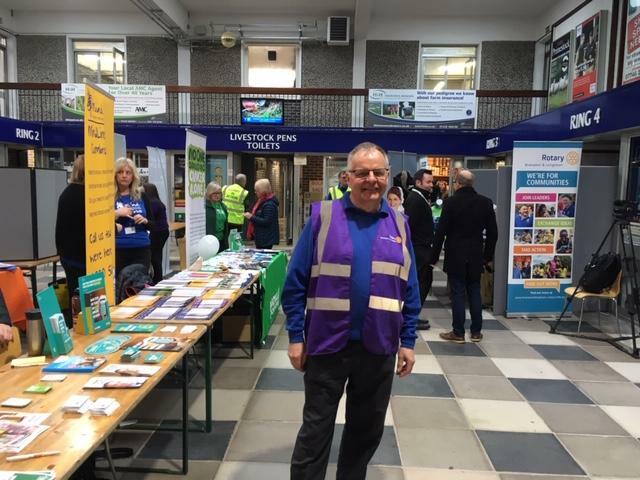 Health Checks, Longtown Dementia Hub, Metal Detecting and Ten Pin Bowling - busy spring programme! April 2019 Ten Pin Bowlng Final - we came second! April 2019 Metal Detecting 2019 Check out our previous Metal Detecting events. October and Early November 2018 A busy few weeks! March 2018 Preparation for our Annual Metal Detecting Competition ! February 2018 Painting & Decorating for a Royal visit to Mencap Carlisle Grace Little Centre. January 2018 The first meeting of the year saw the club in Longtown. The club now meets on the 1st & 3rd Wednesday of the month, usually at the Golden Fleece at Ruleholme. Planning for our Annual Metal Detecting Rally in April is going well. 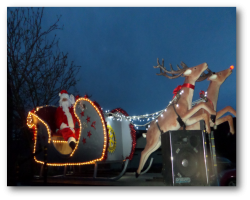 December 2017 This saw the club help out at the Annual Longtown Pensioners Party, then spend two evenings with Santa and his reindeer travelling around both Brampton & Longtown. Finally we held our own Christmas Party at Skitby House. 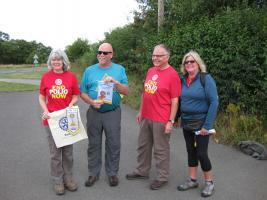 October 2017 Planting Crocuses in Brampton & Longtown to help promote the Rotary Project to eradicate polio. October 2017 Marshalling at Lake of Lights, Talkin Tarn for Eden Valley Hospice. December 2016 taking Santa around Brampton & Longtown. Click on the links for photos. December 2016 Helping at Longtown Pensioners Xmas Party. November 2016 Presenting funds to the Youth Zone. November 2016 marshalling at Brampton Christmans Light switch on. November 2016 Undertaking Mock Interviews for young people at William Howard School, Brampton. October 2016 we helped out at Carlisle Foodies Fest and the Cumbrian Run. Click on the links for further details. September 2016 saw two new members join the club. We welcome James and Lesley Porter who have transferred from Bicester Rotary. Click on the badge below to visit our facebook page for regular updates. For best results you will need to log into facebook with your personal account. Our club has been very busy again these past few weeks and, as you would expect this time of year, most of it was Christmas related! A new approach to membership. This month the Club welcomed its first Corporate Member, the local branch of the Newcastle Building Society. 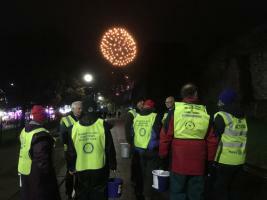 From Airport Disasters to Whooshing Fireworks via Cumbria Running, Light up a Lake and Tree planting we've had a busy few weeks last October and early November. The photo doesn't do justice to the volume of toiletries and foodstuffs Members had collected earlier in the month and this was presented to Peter after the meeting. Word must be getting out, our Smoothie Bike had another outing. Can an elephant ride a bike? Cath Nash was welcomed as the latest member of Brampton & Longtown Rotary club.